One Man's Lonely Adventures In His R33 Skyline GT-R: Tomei 's new Titanium Exhaust... the Results are In! Tomei 's new Titanium Exhaust... the Results are In! Well today couldn't come fast enough. 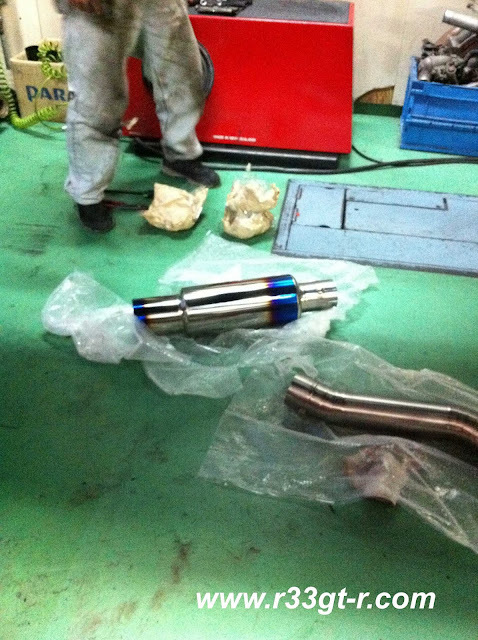 As of last Friday, Tomei Powered had shipped their new Expreme Ti full titanium exhaust to BeAmbitious to be fitted to my car - most likely the first in Japan! Now all I had to do was to find a place to dyno the car before and after the new exhaust was fitted - so we could see the difference in power, if any! Ninomiya-san at BeAmbitious to the rescue - he was able to, at short notice find a shop that had both a Dynapack and was willing to swap the exhausts, and do two sets of dyno runs, for a reasonable price. So off I went today to this shop - called Uchida Car World near the Yokohama Lalaport shopping center, down the street from BeAmbitious. So I apologize for the "thin" videos that follow. 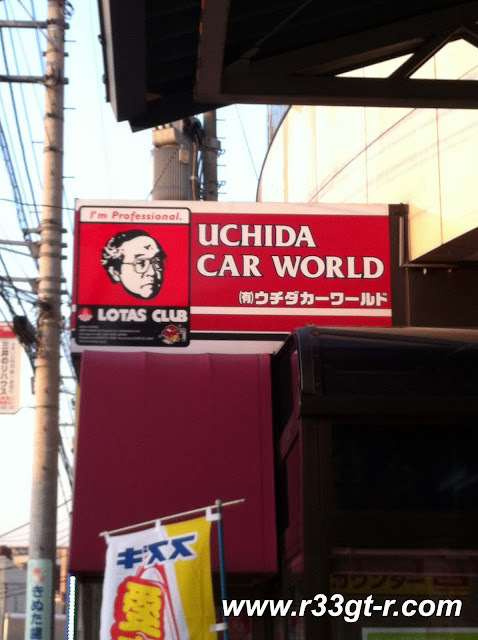 After getting scolded for revving the car on the street - you see Uchida Car Works is on a busy pedestrian street! 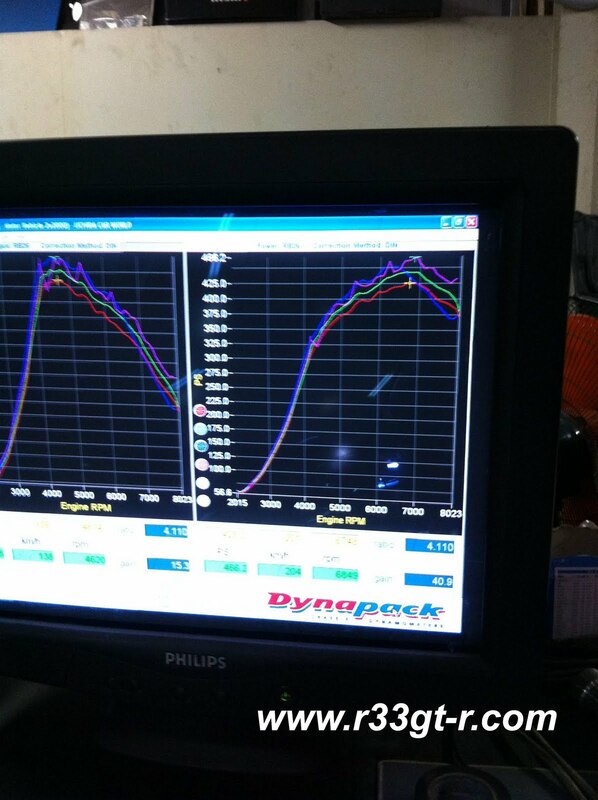 - we waited until they moved the car inside the garage to be set up for the dyno - a Dynapack which measures at the hubs. This is in contrast to the rolling road type of dyno at SuperAutobacs where I had my car measured about 4 years ago. Suspecting a short or ground issue, he began poking around... and then we began to literally disassemble the dash to figure out where the wiring went. After spotting some burnt wiring, luckily we found that it was a blown fuse, so we put the interior back together and we were in business. But this time - in order to obtain the best results possible, we set the max boost at 1.5. First run - 425.3 ps and 54.6 kg/m of torque. Ok, respectable numbers - but Uchida-san said he wanted to let the engine "warm up" a bit... so we waited a few minutes and then ran again. Second run - 442.2 ps and 56.2 kg/m. Not bad at all considering these are numbers at the hub, and uncorrected for "what the engine makes." Ninomiya-san had suggested we view only the raw data much as he did in his Nismo days, so that's what we did. Dino commented that a "standard" correction number thrown around in the GTR world was 20%... Ninomiya said 10%... and later research on the web I found 15%. Anyway, a whole can of worms... but I'll take the 20% figure!!! LOL. 20% means that 442.2 ps at the hubs is "REALLY" 1.2 times that at the engine, or 530.64 ps!! Heck I'll take that! And furthermore, given that the boost as reported by Ninomiya went all the way to 1.38, VERY consistent with my results at SuperAutobacs 4 years ago (508ps at 1.3). THen it was time to remove the car from the Dyno, lift it up and replace the Fujitsubo with the Tomei exhaust. Here it was as they began laying it out. Unfortunately the sound did not come out as well as I thought it would. But I DID measure using an dB meter app - and there was a difference of 6dB between the two! The Tomei is LOUD! Will try to re-record something like the first video above. So what kind of performance did the Tomei generate? First run - 452.1 ps, and 58.3 kg/m of torque. Second run - 466.2 ps, and 58.3 kg/m of torque. Again using the "20%" conversion factor - 466.2 x 1.2 = 559.44 ps. So basically 560ps!!! Well even if we conservatively multiply by 10% - ie 1.1, that is still 512.82 ps. Anyway, looking at the raw data, can we say that the Tomei Expreme allowed the car to generate an extra 40.9 ps? (Last run minus first run). Not quite - I think a more accurate comparison would be 466.2 minus 442.2 (both second runs), for a difference of 24 ps. Not bad - but there is ONE MORE FACTOR to consider. On the Tomei run, its better breathing allowed the engine to spool up the turbos to 1.49 (vs 1.38 on the Fujitsubo). Clearly by comparing the graphs (which I'll scan in later) you can see that, up until about 4000 rpm, the power curve is almost identical - but then on the Tomei runs, is more vertical and ends up at higher numbers after. Also you will note that the second Tomei run, the power curve is jagged - we think the clutch was slipping!!! So is this extra 0.1 of boost responsible for the difference? Honestly, I'm not sure. All I know is that the Tomei pipe is gorgeous to look at, at least 6 dB louder (in fact so loud that when I got home, I had to fit the inner silencer), and a few kg lighter. And priced only about 10,000 yen more! (the price of the Fujitsubo has gone up since I bought it!). Conclusion - Tomei it is! So in a couple of days, I'll be tracking the car at Fuji Speedway, and hope to have flyby video so we can hear what it sounds like at speed! LOL. Stay tuned! Not bad but I think the calculation is a little off. The exhaust sounds nice but definitely not as mean or loud as the old Tanabe Racing Medallion - that made all RB26 sound insane! You will most probably find that the note will get a little louder and raspier after a few kms and the metal heats up. Thanks for the comment - but how about letting me know where the calculation is off please? Just curious, and heck would love to be accurate. I'm not the original commenter but I'd be happy to educate on the correct calculations. You can't just multiply the wheel horsepower by 1.1 as a means of calculating this 10% loss. If you could measure the crankshaft horsepower directly, and knew that the drive train would reduce the output by 10%, you would multiply the crankshaft power by 0.9. Thus, to calculate crankshaft power from wheel power you must use the inverse operation, division. Using this method, we see that 466whp/0.9 = ~518hp @ the crankshaft, and 466whp/0.85 (for 15% drive train loss) = ~548hp @ the crank. Hopefully this explanation is easy to follow.